To create a sophisticated coastal dream home with a tropical flair was the intention of both Matt Knauf, owner and general contractor with Knauf-Koenig Group, and architect Falconer Jones of Falcon Design when they teamed up to work on this beauty of a home nestled on a quiet street in the heart of Pelican Bay. “We chose this lot because of its generous size, fantastic location, and southern exposure. It has a gorgeous backyard that opens up to create a spacious and private outdoor oasis. The difficulty was the cul de sac, our challenge was to design a home with fantastic curb appeal that maximizes the less than generous front yard space,” Knauf explains. 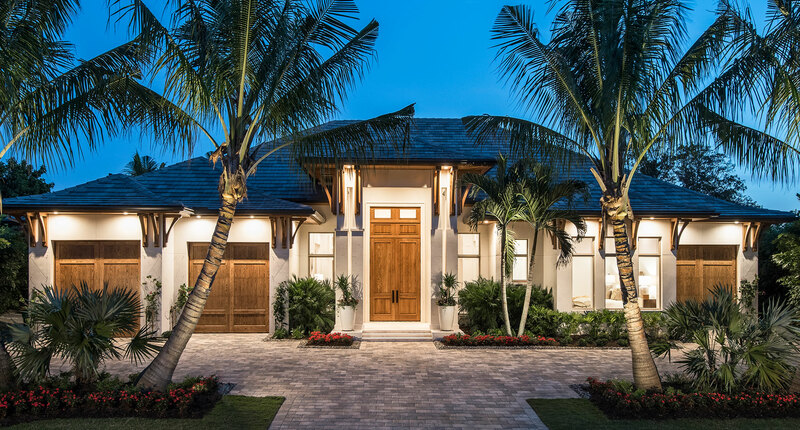 The furnishings for the home were selected in collaboration between Calusa Bay Design and Hayes Elkins Design. “The great room furnishings are both functional and sophisticated, starting with an appealing neutral color palate, with the addition of a soothing and complimentary pop of color — in this case, a beautiful aqua blue,” says Tatum Johansson, Design Coordinator for Calusa Bay Design. The great room emits a chic and classic style with twin Chesterfield sofas by Century, and six bunching cocktail tables fit perfectly in between. Oversized end tables by Vanguard hold classically styled ceramic table lamps from Wilson Lighting. A perfect pair of casual, classic modified wing chairs by Vanguard finish the seating area. Glass boxes, a few coffee table books, and a pair of tall eglomise candlesticks provide the perfect finishing touches. “What makes this room so appealing is the openness to the outdoor living space provided via a spectacular wall of glass in the form of triple French doors with double transoms above,” explains Leslie Sherman, owner of Calusa Bay Design and Partner at Calusa Bay Properties. Other notable features include the intricate trim work on the box beams and tongue-and-groove ceiling detail, courtesy of Knauf-Koenig Group’s renowned expertise in trim carpentry detail. The design team chose a European oak floor from Legno Bastone Wide Plank Flooring, which creates the perfect foundation for a timeless, sophisticated look. The kitchen in this home is the cornerstone of the floor plan, creating open sight lines to the pool and outdoor living areas. 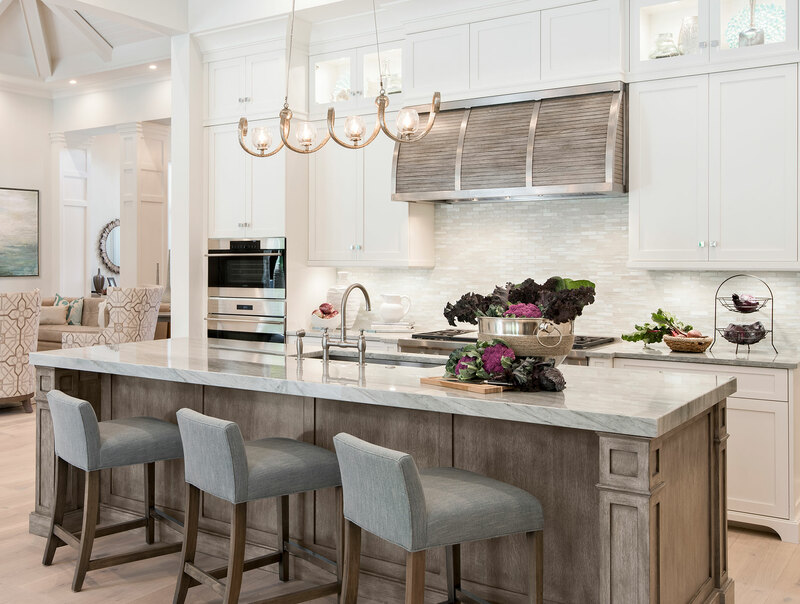 Complementary finishes and beautiful design are everywhere you look, from the two-inch mitered Sea Pearl quartzite used as the island countertop to the Alabaster white and driftwood-colored floor to ceiling cabinetry by Ruffino Custom Cabinetry. Matt and Gisela Knauf were very much involved in the kitchen design process, selecting details like the wood slatted hood with stainless steel straps which quickly became a favorite feature in this well-appointed kitchen. 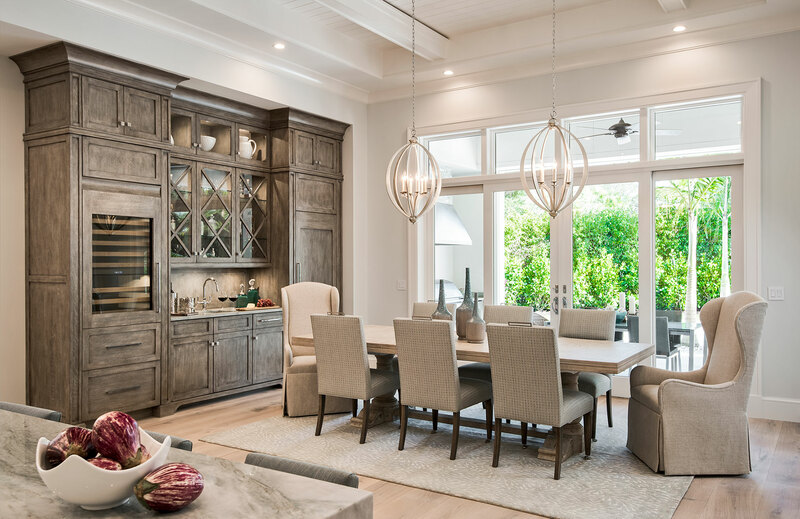 Completing the sophisticated look are Vanguard Furniture’s barstools and the chandelier by Currey & Company, which add a simplistic and feminine edge. Appliances by Ferguson complete the kitchen. “The master bathroom is my favorite room in the house,” says Knauf, and it’s easy to see why he loves it so much. Knauf and Calusa Bay Design were able to create a sophisticated spa-like feel through the use of color, glass, and stone. The focal point of the room is the oversized cast iron freestanding bathtub by Kohler, glazed in a white finish. The master bedroom is graceful and serene in style, filled with soft colors and a calming touch of blue. It overlooks the home’s lushly landscaped and private backyard oasis, feeling like a tropical retreat. “We tried to make the windows as large as possible in every bedroom,” adds Knauf. “Natural light is an important component of the overall design of this home.” The simple but striking four-poster king bed from Bernhardt Furniture is complemented by oversized chests and an upholstered champagne silk chaise from Century and a bench from Dovetail Furniture. 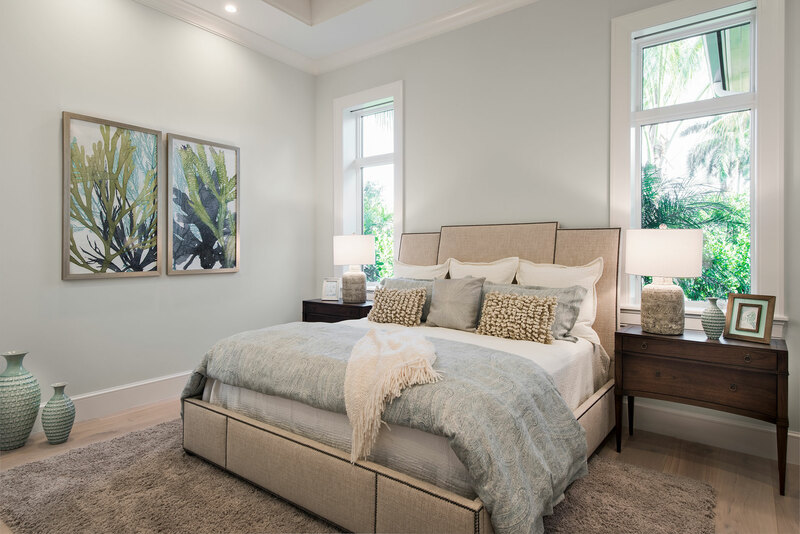 The touches of color are subtle in the master bedroom, created by artful floral choices and linens by Legacy Home with accent pillows in fabrics by Robert Allen Designs. The old-world chandelier by Currey & Company adds a touch of simple charm to this sophisticated room. Viewing the home from beyond the pool, the exceptional design by all involved with the project becomes even more stunning. The 40-foot pool is lined with palm trees from Doria’s Landscaping and has a stepping stone detail for both form and function. The jewel toned water and fire bowl accents complement the natural wood soffit and trim details of the home’s exterior while adding ambiance. “Prospective buyers responded very positively to this home, so much so that we sold it before it ever hit the market,” advises Taber Tagliasacchi, Listing Broker and Partner with Calusa Bay Properties. “The master bathroom, outdoor living, and overall style and quality of the home were all key selling points.” Clearly this talented team has found their niche in the new construction home market with this inviting, well thought out and beautifully appointed coastal chic retreat.